We live in a country fantasising about its ability to run up debts seemingly without end, to enjoy high-paid employment for which it is not qualified, to project military power that it does not possess and in general to assume, in defiance of the evidence, a superior economic and political position in relation to most of the rest of the world. ...Welcome to Fantasy Island. 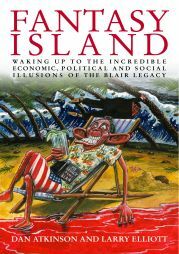 ..Blair leaves behind him a seedy dreamworld mired in debt and bankruptcy, drifting into a crisis of employment and employability, hallucinating into existence a diplomatic and military role that it cannot possibly afford. It's time to take stock of the future he and Brown have mapped out for us while there's still time to do something about it. At the national level, the spend, spend, spend mentality has saddled Britain with a record trade deficit. Hardly noticed in last Thursday's excitement was the release of the latest set of trade figures from the Office for National Statistics. These showed that in March, the UK imported £7bn more goods than it exported - more than 6% of GDP. This figure alone gives the lie to the notion that Britain under Labour has cracked the age-old problem of inflation, since a trade deficit is merely disguised inflation, evidence of excess demand that can only be met through imports. What's wrong with these claims? First, it is disingenous to focus solely on the trade in goods, particularly when the UK services balance regularly posts large surpluses (£2.5 billion in March alone). Second, as this ONS report shows, the goods and services trade deficit has been narrowing over the past year, not widening. Third, one should really look at the overall balance of payments - the current account deficit was 3.4% of GDP in 2006, a lot less scary than Elliott's 6%. The days when the British economy ran largely on goods production are long gone. The services sector - including the City - generates far more employment and value added than manufacturing and primary industries do. Moreover, if financial markets agreed that the trade deficit is "merely disguised inflation" one would expect them to have pushed interest rates higher and the pound weaker. The only "seedy dreamworld" in evidence here is that of a disenchanted left-of-centre hack trying to beat up a crisis where none exists. Try sticking to the facts in future, Larry. P.S. I am not of course claiming Britain faces no economic problems - simply that there is little evidence of crisis, and that on most key measures the economy is in reasonably good shape. Asian stocks rose after oil fell to its lowest this year and Sony Corp. said profit at a unit that makes mobile phones almost tripled. Matsushita Electric Industrial Co. and Hyundai Motor Co. paced advances. The U.K. pound halted a five-day slide against the dollar after Bank of England Governor Mervyn King said inflation remains a concern for policy makers in Europe's second-largest economy. Britain's central bank will need to continue monitoring price increases as inflation picks up after a dip last month, King said late yesterday in a speech in Winchester, southern England. The central bank on Oct. 5 held borrowing costs at 4.75 percent for a second month. U.K. government bonds advanced on speculation the Bank of England will be done raising interest rates after one further increase this year. Yields on benchmark 10-year gilts are near their highest in three weeks as quickening U.K. house-price inflation reinforces expectations the central bank will lift borrowing costs next month, following a surprise increase in rates in August. Hmmm. While it's not impossible for rate hike speculation to have such opposing effects, it does seem a bit of a stretch. Felix Salmon asks: Do markets always move for a reason? When the Economonitor was a wire-service Econominitor, he used to get into arguments frank exchanges of view with his editors on the subject of reporting market movements. The driving conceit of market reporting is that everything moves for a reason – which means that a tiny move upwards in, say, the S&P 500 would be because investors were heartened by some economic data report, while an equally tiny move downwards would be because of "profit-taking" or somesuch. If in doubt, "there were more buyers than sellers," or its converse, would suffice as a "reason why" some given market moved in a certain direction. Jack Shafer notes that at Bloomberg the word "uncertainty" is banned from news stories on precisely the grounds that "markets move for a reason". He doesn't note, maybe because he was never a markets reporter, that at least half of all market reports could be more simply and more accurately replaced with "markets moved and we don't know why". What we do know is that the "reasons" given in market reports are very unlikely, on some deep ontological level, to have a real causal relationship with market moves. What is the most absurd or contradictory market-moving wire report you've read? As Britain's prime minister enters his final few months in office, the commentariat seem keen to enumerate his failings or offer gratuitous advice as to when best to leave. We won't know for years how history judges Blair's legacy, of course. For now, involvement in the messy Iraq conflict overshadows a respectable economic and social record. While 'Blairism' will never have quite the currency that 'Thatcherism' did, that is not to say the Prime Minister's approach to politics has no underlying philosophy. Nevertheless, Third Way politics is no longer in vogue, and the 'stakeholder society' but a fleeting memory. 1. Managerialism is a faith. It says that a centralized organization, however complex or inept, can be well run with the right leadership. Hence the belief that Reid is the man to turn around the Home Office. Technocrats, however, ask: how, exactly, is it possible to run an organization? Failure to adapt to changed circumstances. “New Labour” stormed to power on the back of a brilliant marketing and communications effort, allied to a ruthlessly efficient campaigning style. But governing is different from campaigning. Having established what seemed a winning strategy, Mr Blair never learnt the art of leading a collegiate administration. Failure to manage expectations and follow through on ideas. Mr Blair has been addicted to making hyperbolic claims, which in turn have set unrealisable goals for himself. He has preferred “eye-catching initiatives” to the unglamorous hard grind of policymaking. Adoption of the ‘heroic CEO’ leadership model. Mr Blair is much taken with dynamic business leaders. But he has fallen for the hype which suggests that chief executives achieve great things on their own. He has been unhealthily self-centred. When he announced the time-frame for his forced departure last week, he said: “I would have preferred to have done this in my own way.” That statement is not really compatible with parliamentary democracy. Top-down, autocratic style. Mr Blair chose to ape the leadership style of a predecessor, Baroness Thatcher. Like the Iron Lady, Mr Blair said he had “no reverse gear”, that backbone was what counted, not backing down. This posturing was inauthentic. It also suppressed creativity and limited colleagues’ ability to show initiative. This was itself an overreaction to the John Major years (Mr Blair’s immediate predecessor, who had been perceived as a weak leader). Mr Blair’s fear of the power of the media encouraged this centralised rigidity. Failure to listen to constructive, well-intentioned criticism. Mr Blair and his core leadership team closed itself off from the rest of the government and the wider Labour party. For over a decade his more critical friends have offered advice on changes to his style of government but have been ignored. Many tried to warn Mr Blair that his period in office would end in tears. Now it has. Addiction to arbitrary targets and performance measures. Mr Blair has frequently imported the wrong private sector techniques into the public sector. His government’s crude use of targets has distorted employees’ behaviour and led to unintended negative consequences. Failure to manage a stable and orderly succession and build a strong organisation. Après moi le déluge. Apart from Gordon Brown, chancellor of the exchequer – who seems to be feared and resented in equal measure by the current leadership – no other significant future leadership talent has been brought on. Great leaders leave talented successors and a healthy organisation in place behind them. Meanwhile, party membership is in steep decline and morale is low. The first two points resonate. But a failure to listen, autocratic style, etc are criticisms that one could apply to almost any leader in office for a long period, and whose popularity is waning. Meanwhile, those readers who think the current imbroglio has been unfair to Mr Blair might like to check the new pro-Blair website Keeping the Faith. The strangest thing is how casually we have come to take it for granted. We buy books from Amazon, airline tickets from Easyjet and Ryanair, tickets for theatres and cinemas online, as if doing so were the most natural thing in the world. We check the opening times at the Louvre in Paris or the Museum of Modern Art in New York (or browse their collections) online. We check definitions (and spellings) in online dictionaries, look up stuff in Wikipedia, search for apartments to rent on Craigslist or a host of local lookalikes such as Daft.ie in Ireland. You can buy and sell just about anything (excluding body parts) on eBay. Children seeking pictures for school projects search for them on Google Images (and download them without undue concern for intellectual property rights). Holiday snaps escape from their shoeboxes and are published to the world on Flickr. Home movies likewise on YouTube. And of course anyone with doubts about a prospective blind date can do an exploratory check on Google before committing to an evening out with a total stranger. I recall surfing with Mosaic on my university terminal in the early 1990s. Back then it was mainly about email, finding information and fun sites. Web design was appalling, finding things was hit and miss (even with Yahoo), and surfing the net from home meant long waits. Sometimes if I'd opened up a few new pages I'd go and make a cup of tea while they loaded. These days I research trips and book most of my travel and accommodation online. I order most of my books and some CDs online. I use the internet intermittently throughout my working day - looking up papers, academics, events, news releases... I listen to streaming radio and music on my laptop. I check newspaper and magazine sites. I email. And I blog, of course. i cannot imagine life without the internet. In another 15 years time I expect there will be plenty more to interest, excite, entertain and shock us. Over the fold I have includede several press reports highlighting BIS' warnings about inflation, the need for higher rates, and the impact of globalisation. But you are much better off reading the report yourself.